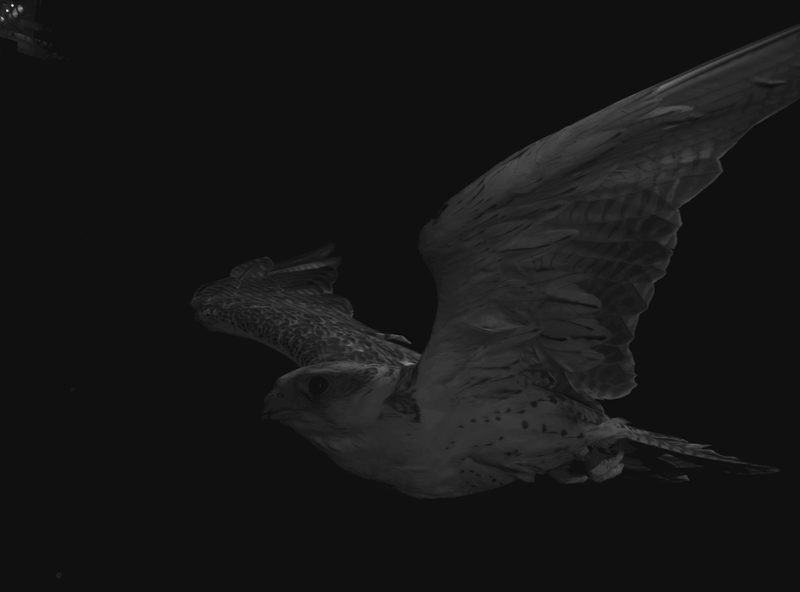 The investigation of a falcon in flapping flight offers enormous metrological challenges. To observe the high dynamics during a flapping cycle, a measuring system is necessary which operates with sufficient temporal and spatial resolution. With flapping frequencies of up to 5 Hz and blade deflections of 200 mm up- and downwards during flapping, a combination of several high-speed cameras is recommended. These are mounted around a measuring volume (approx. 1.5 m x 1 m x 1.5 m (w x h x l)) to detect the complete dynamics of the wing during each phase of the stroke. A total of 10 pco.dimax S4 (1279 fps at full frame resolution of 2016 px x 2016 px) were used in the measurement campaign, with four cameras looking at the top, four more cameras at the bottom and two at the side of the bird. The cameras were mounted in the Atmospheric Wind Tunnel Munich. The facility can generate flow velocity from 2 m/s to 45 m/s and has a measurement domain of 1.85 m x 1.85 m x 22 m. To guaranty a small pixel motion between consecutive images a frame rate of 1000 fps was chosen. The biggest challenge was the synchronous triggering of all cameras, since a shift from one time step in a camera already leads to significant errors in the 3D reconstruction. Therefore a Stanford DG645 Digital Delay Generator was used for triggering the desired frequency with the necessary trigger voltage for all cameras at several outputs. To achieve high depth of field, Zeiss Distagon 35 mm lenses with f-number setting of 11 were selected. On the basis of short exposure time a high light performance with 6 LED lamps of about 10000 lumen was provided. The lamps needed to be positioned at different angles and locations around the measurement domain to enhance the illumination and avoid shadows. LED lights also decrease the fluctuation of the supply frequency in comparison to halogen lights. With all these measures it was possible to record the passage of a falcon and then process it into 3D point clouds. Saker falcon in free flapping flight from a side view position.